Lamisil Once contains Terbinafine Hydrochloride which is the active ingredient. 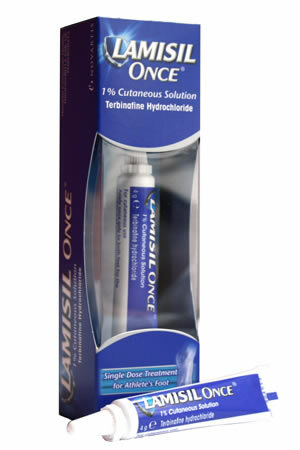 Lamisil Once is a fungicidal treatment consisting of a solvent, terbinafine and a polymer. Use only once to cure your Athletes Foot. Apply the whole bottle to all over the soles and sides of both feet paying particular attention to between the toes. Do not wash your feet for 24 hours. The solvent evaporates leaving a film on the skin which contains the terbinafine. This allows the terbinafine to be delivered to the top layer of the skin (stratum corneum) for up to 72 hours (the fungicidal levels are maintained for about 13 days). The terbinafine molecules bind strongly to the skin cells. Fungicidal treatments such as Lamisil Once exert a direct lethal action on the fungal cell.